The Savage, Beautiful World of Army Ants The ant photographs of Mark Moffett, a Harvard-trained ecologist, are often compared to art. He talks with Alex Chadwick about his latest article for National Geographic magazine on the hidden world of one of the most aggressive species of ant. 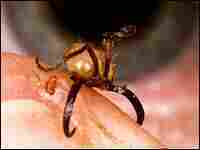 An army ant uses its dramatic jaws to pierce the skin on Mark Moffett's fingertip. 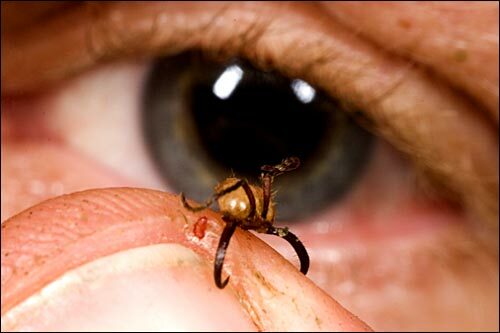 There are 130 species of army ants in the New World alone. But they each share one trait: polymorphism. There are different sizes of ants within a species, each with a special skill. 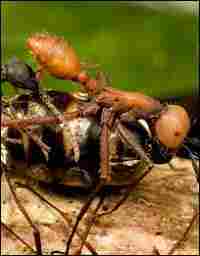 Here, mid-sized army ants carry off a piece of prey. • Army ants don't create traditional nests — they bivouac at night in a protected place, creating a "nest" by connecting their own bodies to form a mass. • There are an estimated 1,000 trillion ants living on the planet at any given moment, representing 11,800 known species. • Ants inhabit almost every habitat on Earth — including the stomachs of some frogs. In a tropical rainforest, ants can constitute up to 15 percent of the total animal biomass. 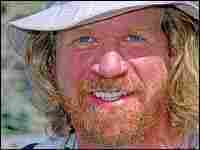 • Some ant species use tools and herd and "milk" other animals. • Highly organized ant colonies can last for hundreds of years. The ant photographs of Mark Moffett, a Harvard-trained insect scientist, are often compared to art. Moffett has a unique ability to capture the alien beauty of these deceptively simple creatures. In reality, ants may very well rival humans for control of the worlds they inhabit. The total weight of all the ants on the globe is about equal to the weight of all the humans. And ants inhabit all but a few environments "conquered" by mankind. Humans faced with a wave of army ants swarming through a rainforest would be wise to get out of the way. Alex Chadwick: You're going to write a series of articles for National Geographic -- write and photograph them -- about ants and the world of ants. You're beginning with army ants. Why are they called army ants? Mark Moffett: Well, army ants are basically experts at the art of war. They have a couple of characteristics in that respect. Actually many, but two basic ones that are often talked about. One is their nomadism -- they are migratory, moving around constantly as they run out of food. And the really critical thing is the way they actually attack, the way they work together in these massive raids that they organize. AC: So you sort of imagine it like maybe trench warfare in World War I -- huge numbers of guys hunkered down for a while, and then they all get up and move? MM: Well, it's more like The Lord of the Rings movies, if you recall those. Mr. Peter Jackson did a marvelous job -- maybe he was thinking of army ants, because you have these vast landscapes. You could imagine being down at the ant's level and suddenly, over the crest of the hills, would appear untold numbers of horrific warriors rushing ahead. And this is exactly what it would be like to witness the arrival of army ants if you were a frog or small creature down in the leaf litter of a rainforest. They're often called "driver ants" in parts of the world too because they actually drive their prey ahead of them. Because of the sheer force of numbers, the army ants are capable of killing things vastly larger than themselves. AC: You write that they are blind -- but in these pictures that you take of them, I see little dots on the side of their heads, which I take to be eyes. MM: Well, they have no ability to form an image. Basically all they can do is tell night from day. And so the lives of army ants are lives associated with smells and vibrations. And they move amongst each other with... pheromones that they lay down on the ground. And through very simple communication signals, they can organize vast groups -- and this is a fascinating thing for scientists, and applies potentially to things like the organization of computers and other things about technology. So people are quite interested in ants, and particularly army ants. AC: Because of the way they associate themselves in fairly simple patterns, but very clear patterns? MM: Very clear patterns emerge from very basic behavior. A single army ant is basically incompetent -- it's a soldier trained to do certain things very well. Those things seem very simple, but you add 10,000 or 100,000 or a million or more of these soldiers together, patterns emerge that are unexpected. Raids can be 15 yards across and contain 100,000 or more ants moving in a very organized way -- a swarm in front moving forward rapidly, and a fan of columns behind where the ants tear up and prepare the prey to be carried back. They're killing huge numbers of prey constantly during these attacks. AC: I have to ask about one of these pictures in the (National Geographic) article... It's of one army ant confronting many other army ants. These are two different species of army ants -- I didn't realize there were so many different kinds. One is very big and the others are very small. Why is that? MM: There are over 130 species of army ants in the New World alone. 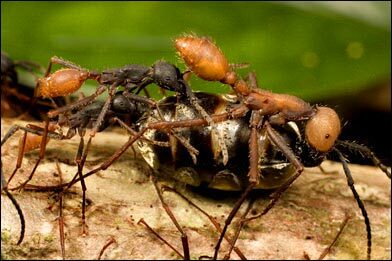 The different species differ in many things, but one of them is polymorphism -- that is, workers within one ant colony can vary quite a bit in size and shape and do different tasks or play different roles. So in that picture, you have a number of the middle-sized workers confronting a soldier of the other species. They're basically harrying it, and pulling on it as if they were trying to deal with an elephant, from this perspective. The soldiers usually function simply to deal with people like entomologists and anybody silly enough to get close to army ants. They attack vertebrates and keep the colony safe. AC: You have some pictures of the jaws of these creatures that... look like they've got elephant tusks, for heaven's sakes. MM: You can tell a lot about how cool an ant is going to be from its jaws in many cases. I'm doing this book for Harvard and I'm going around the world, often looking for the coolest jaws going. The ants with the most elaborate jaws are often the ones that do the most bizarre things. These soldiers have jaws that seem to go on forever, these vast tusks which are used to pierce vertebrates. They don't use them in killing prey -- they're just after us. And they pierce quite deeply. They go right down, I would imagine, to the bone. AC: I know that other National Geographic photographers I've spoken with like looking at your pictures a lot. How do you do this? This is a very small world that you're photographing. Do you use special lenses and little tiny strobe lights? MM: I figured out how to photograph ants by using a book on photographing supermodels. I figured out how to put the flashes, attach the flashes to the camera to duplicate the arrangement in a fine arts supermodel studio, with the fill, the hair light, you know, the side light, all those sort of things… The real trick is really knowing your subject, and I come at them as an active ecologist. That's a matter of telling stories and digging deeper and coming up with unexpected behaviors. 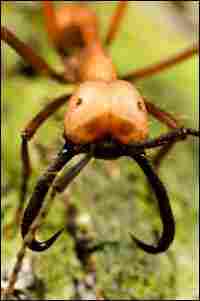 Things like army ants now have been photographed for 50-odd years and have appeared in magazines countless times. But there's lots of nuances. And you can tell the difference when someone really has a passion and knowledge of the subject. AC: Some work all their lives to be successful academics -- and I wonder why that isn't what you do? MM: Maybe I just don't like all the meetings. But in any case, I certainly like being out in nature, and this is one way for me to do it. The primary drive for me is storytelling -- whatever it is, whether it's mathematics or science or art or whatever, to me these are forms of storytelling. Writing and photography provide means for me to tell a story. I don't really care that much about photography in most other ways -- but if I can tell a story with it, it really gets me excited. AC: When you say that you think ants are gorgeous, what is it about an ant that is gorgeous? When I look at your pictures -- and they're beautiful pictures and striking images -- these look like alien creatures, maybe from a bad dream. MM: Well, I don't know what kind of dreams you've been having, but these are my good dreams right here. To me, ants are elegant creatures in what they do and how they move through the world, and the way they're built to do that. They are indeed very alien. They share a lot of the genetics with us, though, so the way they work is more like us than we might imagine sometimes.